As a support rep I’m constantly asked questions. Everything from “how do I trigger automated emails after a social sweepstakes?” to general life questions like “why did she leave me?” (yes, live chat can be a wonderful thing, particularly late at night). Over time I’ve begun to notice certain trends, - the same questions keep popping up over and over. Today I’ll break down the top 7 support questions we get here at Wishpond and how we tend to answer them. 1. What type of contest should I run? In order to answer this question I usually start by asking what the client is looking to achieve with their campaign. Are you looking for more Facebook page Likes? More community engagement or brand awareness? Do you want to generate more leads for your sales funnel? By starting with a goal in mind, we can work backwards and determine what type of contest would best suit your needs. Sweepstakes: The contest with the lowest barrier to entry. Often only requiring a name and an email address to enter, a sweepstakes is a great way to generate a ton of leads in a short amount of time. Photo Contest: A contest with a slightly higher barrier to entry, a photo contest is a great way to amass user generated content related to your brand. We usually recommend positioning a photo contest around a specific theme or season. Instagram Hashtag Contest: This is one of the easiest contests for users to enter as it only requires they tag an Instagram photo with #yourcontesthashtag. If your target audience is using Instagram, a hashtag contest is a great way to make entry super easy while also allowing people to vote on either Facebook, Twitter, or your website. Quick Tip: If you're looking for Facebook Likes, regardless of what contest you decide to run, we always have the option to make a Facebook Like pop up appear when users visit your campaign on any platform. 2. How do I run a contest on Facebook? This question gets asked a lot, but on Wishpond it’s quite simple. The way you create a contest for Facebook is exactly the same way you would create a contest that you would embed on your website or blog. The only difference is on the advanced options page under “Choose where your photo contest will appear” you’ll select “My Facebook Page”. A drop down menu with your Facebook business page will appear below and you can highlight the relevant option. Quick Tip: If you’re not seeing the correct Facebook business page appearing, you’ll need to make sure that you’re signed into Facebook (within your browser) with an account that has access to that specific Facebook business page. To do this, open a new tab in your browser and sign into Facebook. 3. How does a campaign appear on my Facebook page? Will it appear on my timeline? Once you’ve connected to Facebook, your campaign will appear as a tab on your Facebook Business page. You’ll have the option to rename that tab whatever you like such as “Summer Sweepstakes” or “#ThankYouDad Contest” etc. 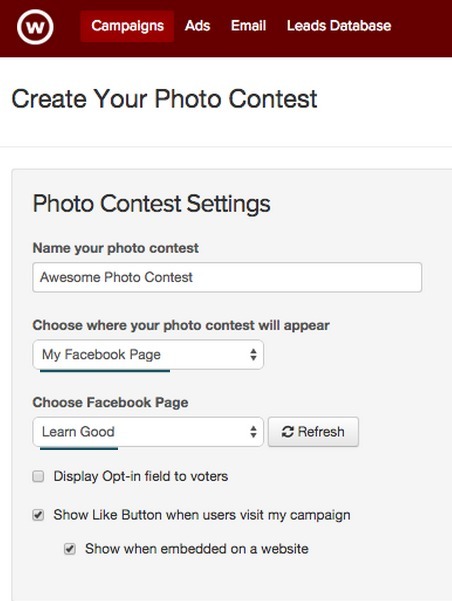 When users click on your contest tab, your campaign page will load as an iframe inside of your new Facebook tab. For more information on customizing your Facebook contest tab, check out our video walkthrough on YouTube. 4. 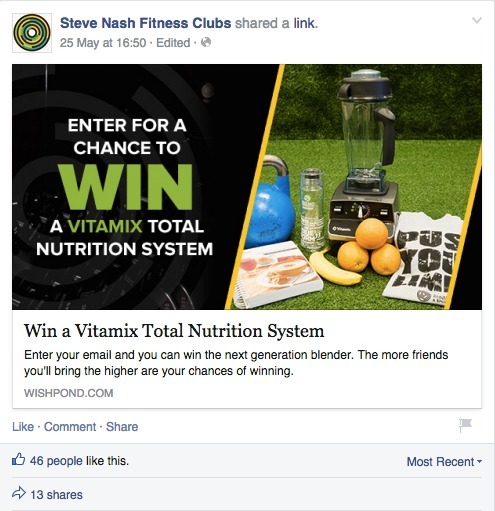 How do I get my contest to appear in the newsfeeds of Facebook users? You have two options to do this, first is by posting a link to the contest on your timeline which will link directly to your contest page. The second way is to create a separate Facebook newsfeed ad. If you choose the first option, we generally recommend boosting your posts in order to give them more exposure. 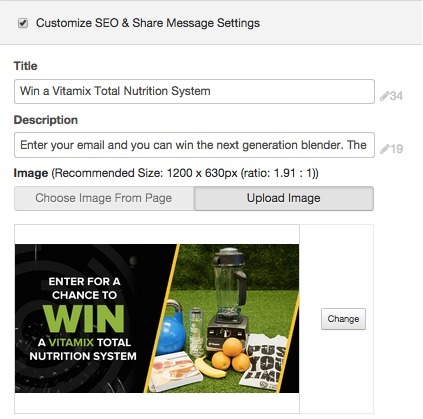 Quick Tip: Make sure you fill out the Customize SEO and Share Message Settings on the Advanced Options page. The image and text you upload in this section will be the default share message when people see your post on Social Media. 5. 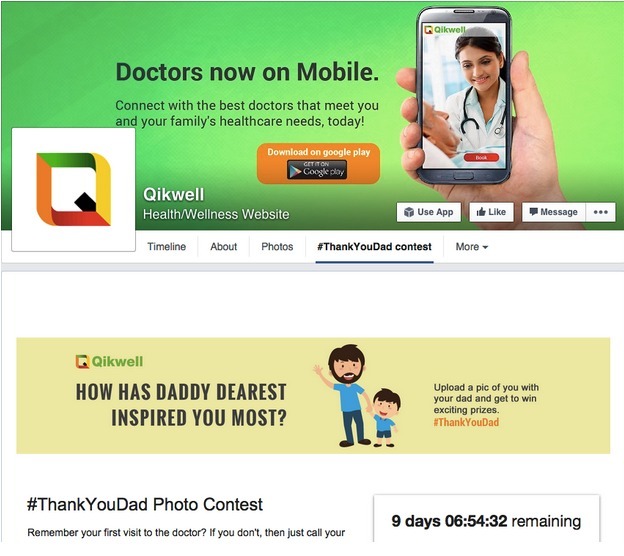 How does an Instagram Hashtag Contest work? An Instagram Hashtag contest pulls photos off of Instagram using a specified contest hashtag. For instance, say I choose #springcleaning as my contest hashtag. Once I make my contest live, all photos with #springcleaning will be pulled into my contest gallery which can then be displayed and voted on either my website, Facebook, Twitter, or a Wishpond Subdomain. Entry options can include moderation, which will allow you to moderate photos before they are entered into your contest (this is all done from inside Wishopond’s campaigns dashboard), requiring users follow your Instagram profile to enter, and requiring users to tag your Instagram handle to enter. They haven’t met the contest requirements such as following you or tagging you in the photo. The photo was uploaded prior to when the contest began. The users Instagram profile is private and therefore their photos are unable to be found via a hashtag search. 6. What type of prize should I give away? We generally suggest giving away a prize that is relevant to your business, that way you’ll know the people who enter your contest are legitimately interested in your products and services, and not just a fancy prize. What tends to work very well are gift certificates, gift baskets, and seasonal gifts. 7. How do I select a winner for my Contest? Depending on what type of contest you’re running there are two main ways to determine a winner of a contest; public voting and randomizing a winner. Voting works great for photo, video, and caption contests, while random winners are usually limited to sweepstakes and referral contests. At Wishpond, we have a ‘Randomize’ button inside of your sweepstakes report which will allow you to autogenerate winners once your contest is complete. If you want to select a winner based on votes, simply export a Microsoft Excel file (CSV) detailing all of your voting data. There you have it, the top 7 Wishpond support questions answered in one place. In order to prevent this article from getting too technical, I omitted a number of questions we already have answered in our knowledge base. If you’d like to like to dive a little deeper, feel free to check out our help center. Have a question you’d like answered? Feel free to leave it in the comments below or visit corp.wishpond.com and we can talk about it over live chat!